My son and I have been experimenting with homemade popsicles again and we discovered another yummy combination........ pureed strawberries and fresh orange juice! Juice the oranges and strain the juice. Add 1 Tbsp sugar and mix well. Set aside in a refrigerator. Wash strawberries and pick off stems. Puree them in a blender or food processor. Blend in 1 Tbsp sugar. Pour strawberry puree into popsicle molds to fill the bottom half of the molds. Place in freezer for about 1 hour. 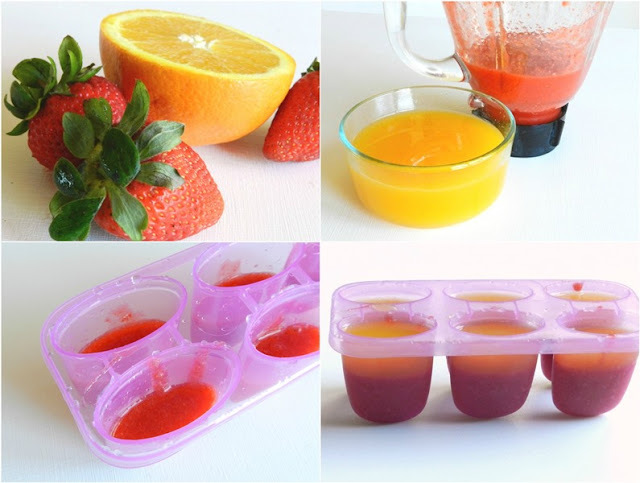 Take out popsicle molds and pour orange juice mixture to fill the molds. Place popsicle sticks or popsicle mold handles into the molds and freeze for an additional 2 hours. Run the molds under hot water for about 30 seconds to get the popsicles out of the molds. Then all that's left to do is to sit outside on the back porch and enjoy them! Great idea. When I read this I had a flashback to my childhood when my mother would freeze fruit cocktail in Dixie cups with a stick. We thought they were grand fun. Alas, when I think of this now, I realize most (although not all) canned fruit has little vitamin content left. But there's something really fun about eating a common food frozen... Kept us quiet and happy for a while anyway. these look delish!!!! I am going to bookmark your page and try this with my granddaughter next week. Yum! What a great idea for the kids this summer. I am going to share on my FB page. Link this up to the challenge this week on my blog. It is the Summer Desserts and Goodies challenge. We usually do craft challenges but I like to throw in a cooking challenge every now and again. Link up begins Wednesday night. Come on over! I love the colors too. That is a combination of flavors I love. Great pictures. Pinned this! These look great! I bet they would work in my Zoku maker! Pinning this! Genius Idea! I am putting together a round-up of great frozen treats, and I'd love to include this. If it's cool with you, I'll just grab one of your pictures and give you a link back--I would never take part of your recipe/tutorial. If this isn't okay with you, just let me know. you can email me at nancy(dot)verly(at)gmail(dot)com. Thanks!